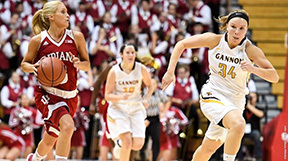 The Gannon University women’s basketball team was no match for Division I Indiana University Monday in an exhibition game played in Bloomington, Ind. The Knights knew it would be tough going against the Hoosiers, and the host team came away with an 82-38 victory. Maggie Mitchell scored 11 points to lead Gannon, which will open its regular season Friday in Charlotte, N.C., against Elizabeth City State at the Pennsylvania State Athletic Conference (PSAC)/Central Intercollegiate Athletic Association (CIAA) Tournament hosted by Johnson C. Smith. The Knights will play a second tournament game at 4 p.m. Saturday against Johnson C. Smith. Indiana opened up the game ready to win, as the Hoosiers went on a 12-0 run before Gannon got on the board, midway through the first quarter. Chelsea Rourke hit on a three-point shot and Mitchell netted her first two points to cut the lead to 12-5. In addition to leading the team in scoring with 11 points, Mitchell also grabbed five rebounds and four steals. Rourke finished with nine points while Nicole LaCava added seven points and a team-high nine rebounds. Sydney Mitchell scored six points in her first game with the Knights. After trailing 18-8 at the end of the first quarter, Gannon battled Indiana on near-even terms in the second quarter and looked at a 13-point deficit – 35-22 – at halftime. LaCava’s three-pointer got the Knights started on the right foot in the third quarter but Indiana then scored 17 straight points over a seven-minute stretch en route to outscoring Gannon 26-5 in the quarter. That run sealed the outcome for the Hoosiers. Gannon made just 12 of 55 shots from the floor while Indiana shot an even 50 percent, connecting on 30 of 60 shots. The Hoosiers also were effective on defense, coming up with 16 steals to thwart Gannon’s attack. Gannon could not compete with Indiana on the stat sheets, as the Knights finished with just seven assists, eight steals and 29 rebounds compared with 16 assists and 46 rebounds for the Hoosiers.